[Update: While problems with the Nexus 7 originally appeared to be related to defective memory, it appears the problems users were seeing were related to both defective hardware and software deficiencies in Android. An Android app developer initially commented on the issue, stating that it relates to a known "bug in Samsung's flash controller firmware." When users fill up storage to the point of having less than around 3GB free, the firmware triggers a process that runs "unusually slow and can lock up the whole device for several seconds." The comment adds "Google rolled out an update for the Nexus 7 with Android 4.1.2 which doesn't fix the bug but avoids triggering it," and notes, "Google also still hasn't included this fix in any of their Galaxy Nexus updates, which is quite questionable regarding numerous complaints in the Google product forums." "I cant find one person who has been using the Nexus 7 for an extended period of time, and hasnt seen a massive downgrade in performance," wrote Dustin Early for AndroidAndMe in an editorial titled, "One year later, the Nexus 7 has gone from the best to worst tablet Ive ever owned." "I cannot pick up my Nexus 7 without experiencing problems like a lag of ten seconds, or more, just to rotate the display," Early wrote. "Touches refusing to acknowledged; stuttering notification panel actions; and unresponsive apps." Early said he was originally "blown away" by the Nexus 7, writing "it was the perfect form factor for Android, and probably the best Android device I had ever used at the time. All for just $200. You simply couldnt ask for more in a device." Now he says it's "just a shell of its former self," and called the device "an embarrassment to Google." Despite trying a factory reset and then "drastic measures, like rooting and installing CyanogenMod 10.1" which Early "thought would surely fix everything" based on the assumption that "performance problems were merely a lack of software optimization," he concluded, "nothing seems to work." Comments on the article indicate his experience is not unique. "I have all the same exact issues. Horrific lag when doing anything in the browser, any simple multi-tasking, and at least one crash/reboot per hour, wrote Kunal Patel. "Im amazed at how quickly the Nexus 7 deteriorated." A variety of comments noted similar issues, not just with Google's Nexus 7 but also other tablets build by Asus, the manufacturer Google uses to build the device. In particular, users called out the Asus Transformer Prime. ended up selling it. Ive also used the Transformer Prime extensively and Transformer Infinity for several months and they all fell to the same problems. This is most definitely Asus manufacturing issue." "After a few weeks, the lag returns, the unresponsiveness creeps back, and tap recognition is hit and miss"
Other users blamed Android's software for failing to properly maintain devices' SSD memory. Several suggested downloading utility apps designed to manually zero out the installed memory, a process that takes about 20 minutes on a 16GB device. "I tried that and, yes, it worked," one user noted. "But after a few weeks, the lag returns, the unresponsiveness creeps back, and tap recognition is hit and miss. No app can fix the physical problems that I and others have with our 7s. Screen separation in the lower left quadrant (in portrait orientation) is testament to the overall quality of this device. Every time I pick up my 'squishy' device, I am reminded of its bargain price." One problem at the core of the issue seems to be related to early failure of SSD memory. Unlike the conventional mechanical hard drives, which typically either fail immediately or last for several years before nearing the end of their useful life span, solid state memory progressively wears out as it's being used. High quality flash memory can provide a significantly longer lifespan than cheaper versions, but it also costs more. All SSDs requires intelligent, low level software to identify blocks that are no longer working and work around them. SSD also requires routines for handling cleanup of erased data, as solid state memory must be erased to zero before being rewritten to, a step that isn't necessary for conventional magnetic hard drives. If these "garbage collection" tasks aren't performed properly, performance degrades over time. Over the several years of engineering iPods, iOS devices and SSD based Macs including the MacBook Air, Apple has invested lots of resources into balancing performance, efficiency and longevity in its products using solid state memory storage. Last August, shortly after the Nexus 7 went on sale, Forbes interviewed Asus executive Benjamin Yeh, providing some insight into the rapid development of the Nexus 7. After the disastrous launch failure of Android 3.0 Honeycomb tablets on Xoom hardware developed by Motorola in 2011, Google "decided to look further afield than their acquisition Motorola Mobility," the report stated. Google approached Asus in January 2012 after seeing the manufacturer's tablet designs at CES. Just four months of engineering work later, the two companies began mass production of Nexus 7. To provide some context on Nexus 7's unusually rushed design cycle Yeh explained, "For a mass-market device, from concept to mass production, were talking about six to twelve months. Six months is very tight." Google wanted the device to be "fast, cheap and good," as well as "thin and light," and ready to debut by that summer's Google I/O conference. This placed extreme design challenges on Asus. Asus chairman Jonney Shih described Nexus 7 co-development with Google to Wall Street Journal blogger Ina Fried, noting, "our engineers told me it is like torture." And Google's former head of Android development Andy Rubin noted that, after factoring in the Nexus 7's marketing costs, "When it gets sold through the Play store, theres no margin. It just basically gets (sold) through." That brings to mind Steve Jobs' prescient observations on the "avalanche" of Android devices being launched in late 2010, nearly two years before the Nexus 7 shipped. Jobs noted that there were only "a handful of credible entrants," and that they were forced to used a "tweener" 7 inch form factor to hit low price points in order to compete with the iPad. "Our potential competitors [in tablets] are having a tough time coming close to iPad's pricing," Jobs said. "iPad incorporates everything we've learned about building high value products. We create our own A4 chip, software, battery chemistry, enclosure, everything. This results in an incredible product at a great price. The proof will be in the pricing of our competitors' products, which will offer less for more." At its launch, the Nexus 7 garnered much praise for its display, build quality and performance. Even TechCrunch reviewer MG Siegler, who is seen as an unapologetic fan of Apple's products, wrote that, "with the Nexus 7, Google has, for the first time, created an Android product that I would buy for myself. And I wouldn't have an issue recommending it to anyone else." 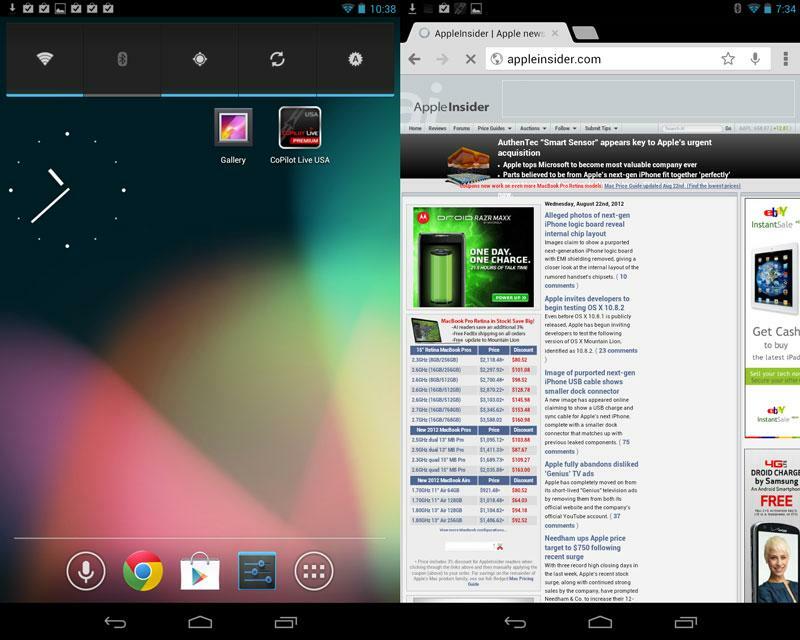 Writing for The Verge, Joshua Topolsky, wrote, "Google's Nexus 7 isn't just an excellent tablet for $200. It's an excellent tablet, period." The Nexus 7 also won product of the year awards from a variety of sources, including being awarded the "Best Mobile Tablet" at the GSMA Mobile World Congress; both "Tablet of the Year" and "Gadget of the Year" by T3, and "the superior small tablet" by CNET, ahead of Apple's iPad mini, which it called "the luxury latecomer." And while a more critical review noted that "Google apps run better on the iPad Mini than the Nexus 7," CNET found it newsworthy that its "reader poll" favored the Nexus 7 over the iPad mini by a significant margin. In reviewing the product for AppleInsider, Neil Hughes wrote "the Nexus 7 is a compelling piece of hardware," but added,"this device is no iPad, and it doesn't even feel like it was made to compete with Apple's market dominating tablet. The narrow screen feels best suited for primarily reading books with the occasional Web browsing and app usage, which pits the Nexus 7 as more of a Kindle competitor than an iPad challenger." Despite its many awards and raving reviews, the Google Nexus 7 appears to have sold about 6.8 million units through Q1, according to estimates by industry analyst Benedict Evans. Google hasn't released official sales figures, but Asus does state how many tablets in total it has sold, a number that includes the Nexus 7. Asus just recently warned investors that it expects shipments of both its Windows 8 and Android tablets to come in around 10 percent short of the previous quarter, with tablet shipments expected to reach just 2.7 million in the June quarter. In November, Apple sold 3 million new iPad 4 and iPad mini units in its first weekend of sales. Apple sold another 19.5 million iPads in its March quarter, up dramatically from the 11.8 million in the year ago quarter. This fueled estimates stating Apple likely sold about 12.5 million iPad minis in the quarter.